I just can't seem to find where to get the jobs on which I hit "Saved" with SO Jobs. This answer doesn't seem to be valid anymore. I've hit Saved on a number of them, I'd rather not have to mess around with history to get them back. Is is just me or this is the sort of things that should be obvious somewhere in the UI? Or an I missing something embarrassingly obvious? 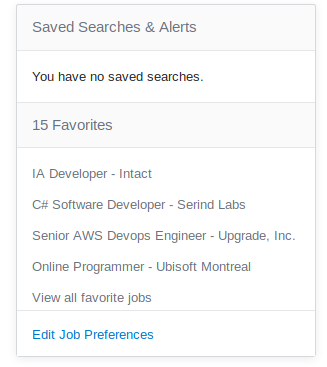 Under "Jobs" (left bar), then on the right, "View all favorite jobs". Actually this is pretty much what the other answer said - but the screenshot isn't valid and I didn't understand it right. At any rate: I don't think this is a great UI design. Something like that ought to easier to spot IMO.